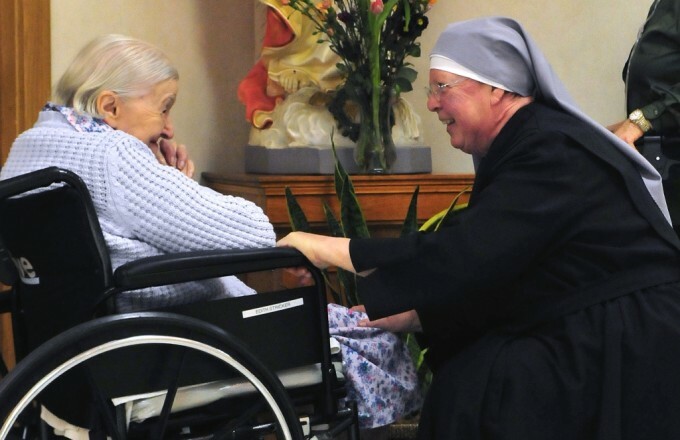 A Little Sister of the Poor shares a laugh with a resident of the order's Mullen Home for the Aged in Denver in this file photo from the Denver Catholic Register. Photo by James Baca. WASHINGTON (CNS) — The Supreme Court Jan. 24 issued a three-sentence order affirming — for the time being — an injunction blocking enforcement against the Little Sisters of the Poor and the Christian Brothers benefits organization of a mandate to provide contraceptive coverage in employee health insurance. The order released late in the afternoon affirmed Justice Sonia Sotomayor’s Dec. 31 order in the case. It temporarily blocks the federal government from requiring the Denver-based sisters and their co-plaintiffs at Christian Brothers Services from having to meet that requirement of the Affordable Care Act. The attorney for the Little Sisters and the president of the U.S. Conference of Catholic Bishops welcomed the order. The requirement to provide coverage for contraceptives in employee health insurance does have an accommodation, or waiver, the government says would keep certain religious organizations from having to comply with the mandate. The statement added that the suit is a class-action case on behalf of more than 400 Catholic organizations whose benefits are managed by the Christian Brothers. The Little Sisters and Christian Brothers Services and Christian Brothers Benefits Trust, which manages the religious order’s benefits, object to being required to justify to the government that they should be entitled to an exemption from the mandate. They argue that filling out the paperwork for a waiver that would instruct a third party to provide the contraceptive coverage amounts to them being part of the mechanism for providing abortion and other morally objectionable types of coverage. “To meet the condition for injunction pending appeal, applicants need not use the form prescribed by the government and need not send copies to third-party administrators,” the order said. The court’s order specified that the injunction “should not be construed as an expression of the court’s views on the merits” of the religious groups’ legal claims.